DYOB4 started 4 weeks ago. 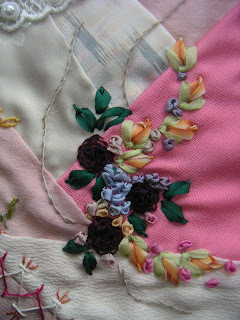 I have been so busy now it's a bit hard to find time to stitch. My naked block for swap. 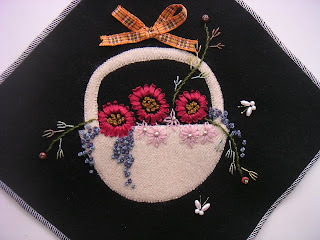 Finally I've finished week1 (double cross and coral stitches), week2 (alternating barred chain stitch) and week3 (bonnet and oyster stithes). My own blocks are still naked. 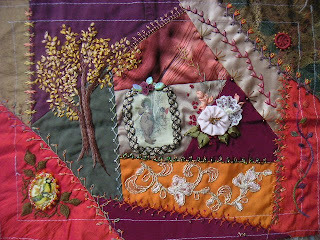 This is my angel work on Lyn's block of Autumn RR in CQI. Here's the finished block after me. 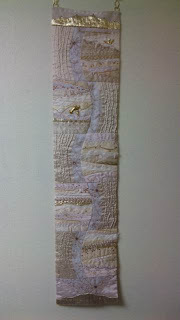 Here's my work for Karrin's Wool DYB block. I've put small butterflies of pearl beads. 冬来たりなば春遠からじ If Winter comes, can Spring be far behind? Now in the CQI, Leslie is organizing a CQ A-Z Lesson for newbies. It's started from January and there have been so useful lessons given by members. 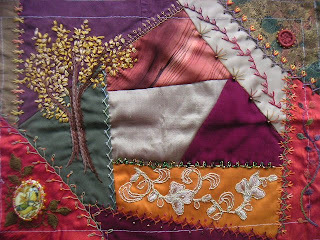 This is one of the block piecing methods Diane taught us. 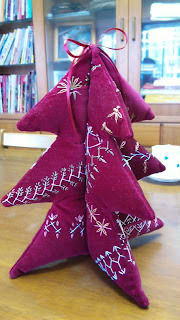 I used her pattern and just sewed the fabric pieces in order. 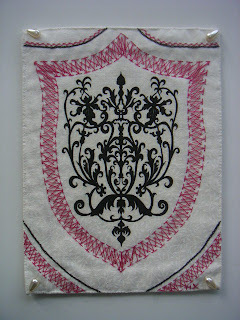 Here's the finished one after my embellishing. According to the Japanese traditonal old calender February 4 is the day spring starts and we call the day "Ri'syun", though we had the coldest weather on that day. I stitched the word of "Ri'syun" in Chinese characters. I feel I am not good at handling pink. 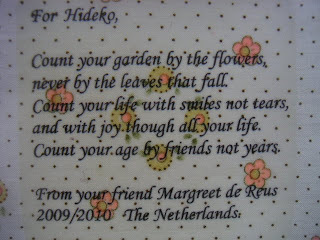 I completed this block as my AA for Margreet and mailed it her. I chose a line from Shelley's poem for her to add. 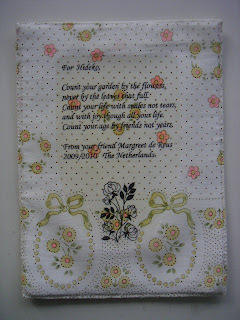 I've received an AA page from Margreet in Netherland. 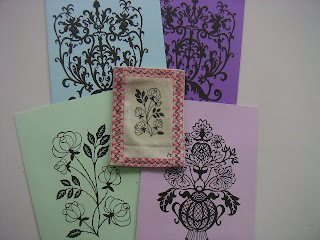 She is a so much tallented lady with not only needlework but also papercutting work. Thank you very much for lots of handmade cards too, Margreet!!! I really love this poem she chose for me. Those words have brightened up my recent gloomy heart. Lynn Schoefflor is a so tallented CQer and my very good friend. 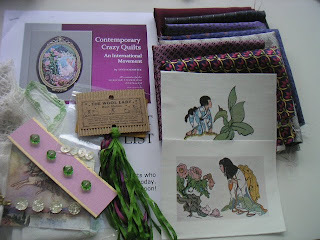 She had asked me for loaning some small Japanese tasted CQ work of mine for her presentation at the San Jose Quilt& Textile Museum last month. 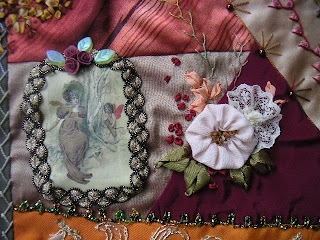 How honored for me and for my work to be exhibited with Sharon Bogon, Jo Newsham, Rengin Yazitas, Alison Aller, Pat Winter, Leslie Ehrlich, Maureen Greenson and so many tallented CQers!! 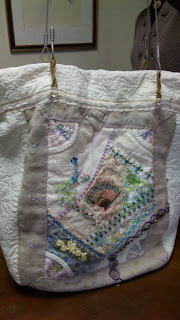 Lynn was so sweet enough to add lovely goodies when she sends me back the quilts. 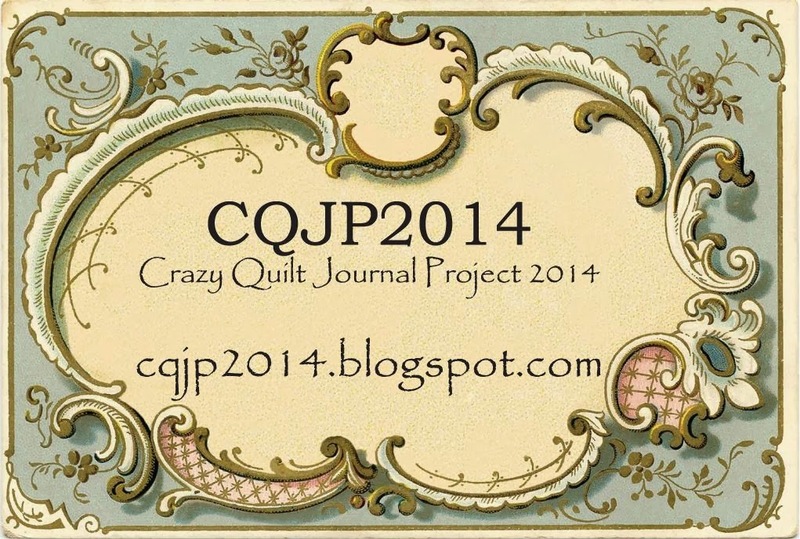 She will write a report of the show and presentation on the next issue of CQ Mag Online. 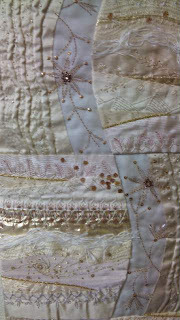 But on the current issue you can see her embellishing for a cq block I made for her two years ago. It's titled "Purple Moon". 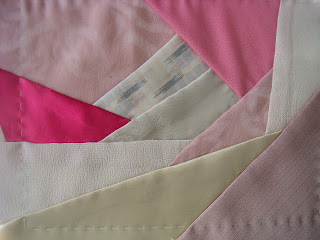 I have been so impressed her work on the Japanese color block is very natural and fit there. 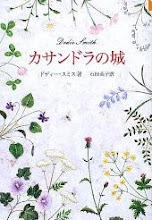 I am sure she really loves and understands Japanese cultures. Everyone was busy in Christmas and New Year Days season. 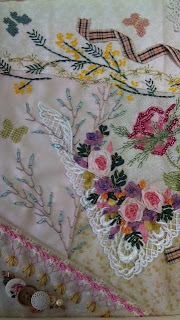 But still each has finished beautiful work to show in my January class. 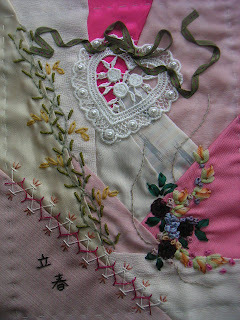 Yuko's Victorian block. These photos are taken by a mobile phone camera so not so good as real one. Here's the whole block, though blur. Her CQed Christmas tree. Original color is more red. Tomoko's very big bag. She has brought her all her CQ stuffs for the class inside. 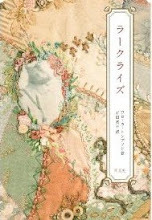 Ikuko's bellpull titled "Champagne". 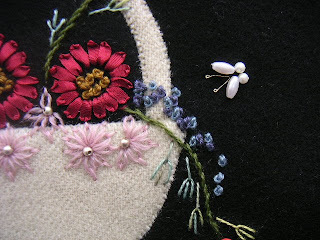 She has expressed its sparkling in a glass by color and beautiful stitches. 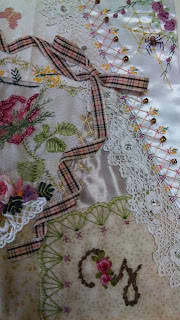 We are planning to have an exhibition of class in this autumn. I hope lots of people will enjoy seeing these beautiful works in person then.